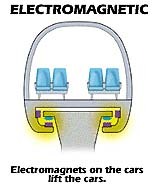 There are 2 basic types of non-contact Maglev systems (we will discuss propulsion later): Electro Dynamic Suspension (EDS), and Electro Magnetic Suspension (EMS). EDS is commonly know as "Repulsive Levitation," and EMS is commonly known as "Attractive Levitation." In the early 1900s, Emile Bachelet first conceived of a magnetic suspension using repulsive forces generated by alternating currents. Bachelet's ideas for EDS remained dormant until the 1960s when superconducting magnets became available, because his concept used too much power for conventional conductors. In 1922, Hermann Kemper in Germany pioneered attractive-mode (EMS) Maglev and received a patent for magnetic levitation of trains in 1934. In 1939-43, the Germans first worked on a real train at the ATE in Goettingen. The basic design for pratical attractive-mode maglev was presented by Kemper in 1953. The Transrapid (TR01) was built in 1969. 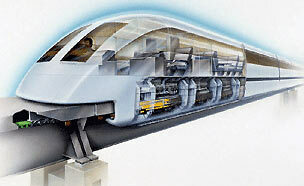 Maglev development in the U.S. began as a result of the the High-Speed Ground Transportation (HSGT) Act of 1965. This act authorized Federal funduing for HSGT projects, including rail, air cushion vehicles, and Maglev. This government largesse gave the U.S. researchers an early advantage over their foreign counterparts. Americans pioneered the concept of superconducting magnetic levitation (EDS,) and they dominated early experimental research. As early as 1963, James Powell and Gordon Danby of Brookhaven National Laboratory realized that superconductivity could get around the problems of Bachelet's earlier concepts. In 1966, Powell and Danby presented their Maglev concept of using superconducting magnets in a vehicle and discrete coils on a guideway. Powell and Danby were awarded a patent in 1968, and their work was eventually adopted by the Japanese for use in their system. Powell and Danby were awarded the 2000 Benjamin Franklin Medal in Engineering by the Franklin Institute for their work on EDS Maglev. In 1969, groups from Stanford, Atomics International and Sandia developed a continuous-sheet guideway (CSG) concept. 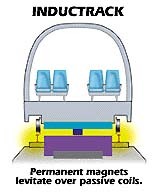 In this system, the moving magnetic fields of the vehicle magnets induce currents in a continuous sheet of conducting material such as aluminum. Several groups, including MIT (Kolm and Thornton, MIT, 1972,) built 1/25th scale models and tested them at speeds up to 27 m/s (97.2 km/h.) The CSG concept is alive and well in 2001 with the Magplane. EDS systems were also being developed in the US in the early '70s, including work by Rohr, Boeing, and Carnegie-Mellon University. Maglev research in the US came to a screeching halt in 1975 when the Federal government cut off the funds to HGST research. Transrapid 08 1999- Current system; Is the only COTS system available today. 1972- Experimental superconducting maglev test vehicle ML-100 succeeded in 10 cm levitation. Meanwhile, back in 1988 in the United States, Congress investigated the possibility of reviving Maglev research. In 1990, Congress authorized the formation of the National Maglev Initiative. Several U.S. systems were considered in depth. 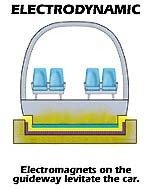 Most Maglev systems designed and tested to date have been the EMS Maglev (also called "attractive" [as opposed to "repulsive"] because an electromagnet is "attracting" the guideway above). Examples include Transrapid, Rotem and HSST. The Japanese have been working on the Chuo Shinkansen EDS Maglev project for many years. They have built a 11.4m (18.3km) test track called the Yamanashi Maglev Test Line. Recently, the train hit 343 mph (550kmph,) a permanent "rail" record. However, there are lots of "negatives" with the Japanese system: $148 million/mile, it uses cryogenic magnets, the guideway is "active" (active systems required to make the train run, normal Japanese Shinkansen run on "passive" rails,) and the guideway is "U" shaped. 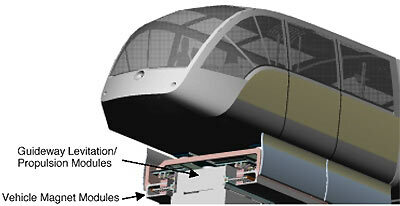 Because it does not fit our definition of a Maglev Monorail, we will not cover this system in the Technical Pages. However, more information can be found online at the on the following Japanese EDS system page. Maglev 2000 of Florida is designing an EDS Maglev system. James Powell and Gordon Danby are on this team, and they were the originators of the EDS concept back in 1966. Another example of a company working on EDS Maglev is Magplane. Magplane is an evolution of work done at MIT in the early 70's by Kolm and Thornton (Scientific American, October 1973.) This system uses a "trough" guideway, but it has the advantages of a less-complex guideway system vs. the Japanese system. A White Paper is available on their website outlining this technology. Inductrack is another type of EDS system currently being developed and tested at Lawrence Livermore National Laboratory. Physicist Richard F. Post has been working on this concept for a few years, and the technology is a spinoff of work done for particle accelerators and payload launchers for NASA. The General Atomics team is using the Halbach concept on their Urban Maglev concept vehicle (see General Atomics papers on Maglev Monorail Technical Papers page). Permanent magnets are starting to solve a lot of the original problems with superconducting magnets and the cryogenic cooling systems: it doesn't need them!